Reposted from Cristina Eisenberg's Huffington Post blog with permission. On April 22, 1970, at the urging of Wisconsin U.S. 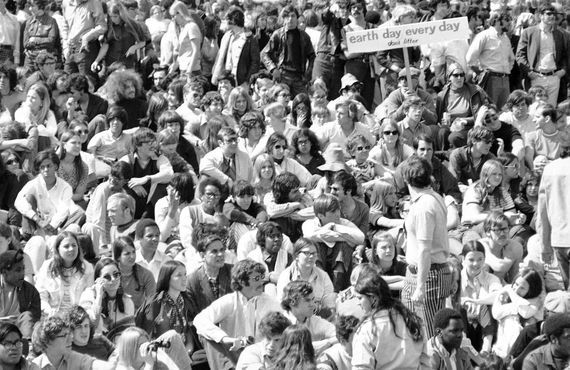 Senator Gaylord Nelson, 20 million Americans participated in the first Earth Day -- a nation-wide demonstration to advocate for a healthier planet. This marked the formal start of the modern environmental movement and heralded the beginning of a coordinated American effort to live more sustainably and ethically with nature. Indeed, the first Earth Day led to the passage of a slew of environmental laws, including the 1973 Endangered Species Act (ESA). In my previous blog post ("The ESA: Taking Noah's Ark into a Brave New World"), I discussed our naiveté in assuming that saving species threatened by extinction would be as simple as creating laws like the ESA designed to function like Noah's Ark. There were many things we didn't know back then that we know now. For example, during Earth Day 1970, as our nation protested environmental degradation, we'd become aware of the mere tip of the environmental damage iceberg. We didn't know then that we'd already set in motion human-caused environmental effects, such as climate change, that were causing a hemorrhage of extinction. And we didn't know that large carnivores could create ecosystems far more resilient to climate change than those that do not contain these keystone species. 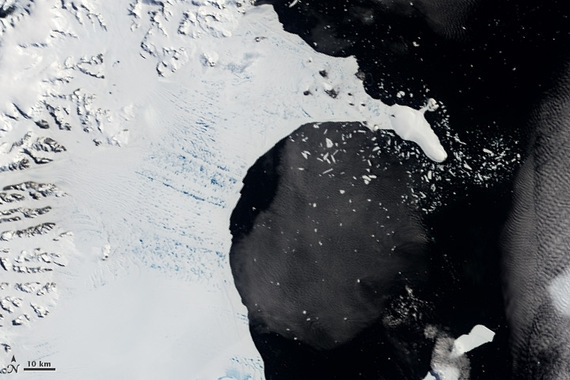 Larsen B Ice Shelf collapsing, Antarctica. Photo courtesy NASA. Balanced at the apex of a Roman arch, the keystone locks all the other stones in place. Remove it and the arch collapses. Keystone predators, such as wolves, are similarly poised to hold ecosystems together from the top down in food web relationships called trophic cascades. 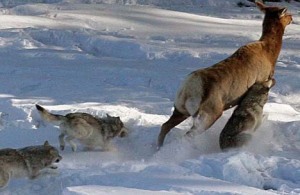 Elk running from wolves. Photo courtesy National Parks Service. Here's how these relationships work: Keystone predators, such as wolves, control prey numbers and behavior. On the lookout for wolves, wary elk eat more sparingly. This releases shrubs and saplings from browsing pressure, improves habitat for other species, and increases biodiversity. These cascading effects are based on powerful evolutionary relationships that were in place until we eliminated large predators in the early twentieth century. While wolves and other carnivores won't slow climate change, they can help create ecosystems better able to withstand it. However, trophic cascades have yet to make it into the climate change solution lexicon. Could this be because combating climate change with wolves is too implausible? Some ecologists think so. But nearly 90 years ago, at least one person was promoting wolf conservation as a means to create more resilient ecosystems in the face of drought and other ecological stressors. That individual was another eminent Wisconsinite, Aldo Leopold. 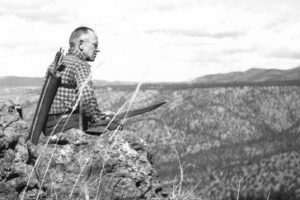 Aldo Leopold in Mexico pondering carnivore conservation. Photo courtesy the Aldo Leopold Foundation. A few years ago, I came upon an obscure journal article by Leopold. Written in 1923 and posthumously published in 1979, "Some Fundamentals of Conservation in the Southwest" reached far beyond the ambit of the known. "Is our climate changing?" he asked in this essay. He suggested that ecological resilience "varies inversely with aridity," and that water, soil, animals and plants, "bear a delicately balanced interrelation to each other." He urged scientists to parse these relationships and managers to apply best science. One decade later in the essay "A Conservationist in Mexico," he recommended doing so by allowing wolves to return in reasonable numbers. That predation was integral to healthy ecosystems was a radical notion in the 1920s and '30s. It's still radical. Managers during Leopold's era, as well as today, focus on habitat conservation and see predators as an inconvenience to be controlled. Leopold suggested a holistic ecological perspective that would enable us to develop better solutions and more ethical relationships with nature. He believed that these solutions and relationships should include carnivores. These arguments are far from settled today. Central to the current intense tug-of-war over removing ESA protection from species such as the wolf, grizzly bear and wolverine, is the definition of a recovered carnivore population and how it ought to be managed. Such arguments illustrate that in our rapidly warming world, we've yet to consider the ecological benefits of carnivore conservation as a hedge against climate change losses. Best science demonstrates that conserving carnivores, be they coyotes in New England, cougars in the Dakotas, or wolves in the Pacific Northwest, could help us adapt to climate change and stave extinction for myriad species. So this Earth Day, as we did the first time we marked this occasion, let's consider innovative, bold solutions. Let's think outside the box. Let's take a leap of faith and imagine a world made as intact and resilient as possible by allowing carnivores to fulfill their essential ecological roles.